The Giant Magnetic Workbench from the Janod Redmaster range is a colourful height adjustable workbench that can be adjusted as children grow. Made of wood, the workbench is painted in vibrant colours of red, yellow, silver and natural wood. The workbench comes with over 40 wooden accessories so that children can build their own toys such as cars, vehicles, in fact just about anything! Also included are 3 magnetic tools which can be slotted into their designated places on the back of the workbench. The workbench also features a vice, chalkboard and a clock. The workbench features removable legs that adjusts the height depending on the child's height (maximum height 50.7 cm). 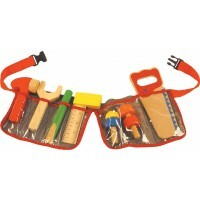 Suitable for young carpenters aged 3 to 8. The Janod workbench is fine and lots of good things to play with but a few of the pieces don't quite fit.